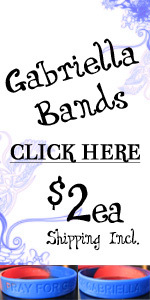 I finally got everything all set up on here to order Gabriella Bands, and the link is in the right sidebar of my blog. As seen previously on my blog, they have been worn by friends, family and even sports figures! It is my goal for everyone who has come into contact with Gabriella either in person or through prayer, to have one of these bands. The red and blue colors of the band symbolize Congenital Heart Defects. The wording on the bands is a simple statement, but we feel it is more of a reminder: PRAY FOR GABRIELLA. Each band is $2, and that includes shipping. All the payments for the bands are being depositied directly into our PayPal account and used for all the same transplant related expenses as any past donations. I emailed you and I will call you tomorrow. Maybe I can share a little of this transplant knowledge I gained since October.